CLICK HERE FOR THE VINTAGE DOMINO GUITAR GUESTBOOK tell everyone why you like the domino brand, people really wanna know. 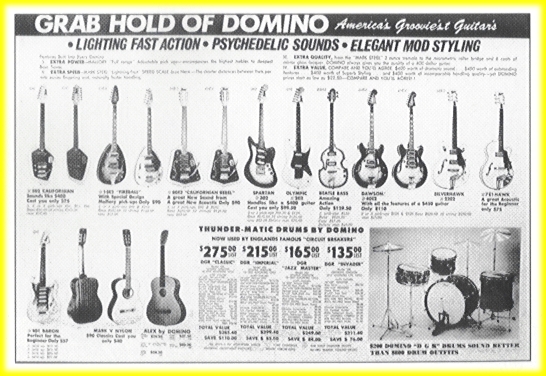 Finally, A place dedicated to the Domino brand musical equipment. The photos have been "borrowed" over the past few years from various sources. If anyone claims ownership of photo content, and objects to their usage, the photos will be quickly removed, please be nice. This page is only to share photos and information on the instruments we know as...DOMINO. This is going to take a long time so many pages won't be up for some time, a work as work allows. More or less, it all started in 1984 for me. My first guitar! I really only wanted a prop, as I was to be the lead singer, but I wanted somthing for my hands to do. We went to a store in Toledo Ohio (Penguin Music), asked for the cheapest guitar, and that it didn't even need to work. They brought out a baby blue, 3 pickup Domino Spartan. It was in pretty good shape and seemed to work ok. I ended up paying $30.00 for this baby. 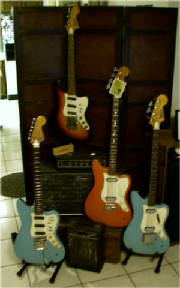 It is now many years later, and of all my guitars over the years, I have saved the Baby blue. I get pretty fickle, here and then, so part of that may lead to slow progress with this page, cross your fingers.